Groß-Sand Krankenhaus in Hamburg-Wilhelmsburg as well as Director of the Hernia Centre that he established there in 2004 and where more than 1000 hernia repairs are now carried out each year. The Hernia Centre was certified in 2014 as a reference centre for hernia surgery by the Deutsche Gesellschaft für Allgemein und Viszeralchirurgie (German Society for General and Visceral Surgery). This is the highest level of expertise and has only been achieved by two other German centres to date. Dr Reinpold has been president of the Deutsche Herniengesellschaft (DHG, German Hernia Society) since 2014. This scientific forum supports the training and continuing education of experienced doctors both in private practice and in hospitals as well as young doctors who would like to specialise in this field. Dr Reinpold and his team are often invited to national and international specialist conferences as experts. 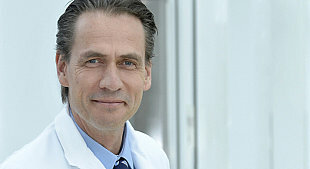 Dr Reinpold conducts training courses worldwide for the MILOS technique that he developed as well as for hernia surgery generally to pass on his knowledge and expertise to other doctors. He is also the scientific director of a number of major hernia conferences both in Germany and internationally. As part of the humanitarian inguinal and abdominal wall hernia aid mission organised by him and his team, each year Dr Reinpold and his colleagues operate on affected people in Nigeria, Ghana, Paraguay and the Dominican Republic, amongst others, in a voluntary capacity.